In one of my previous articles I introduced you to the tree data structure. Now I’d like to explore a related structure – the graph. Graphs have a number of real-world applications, such as network optimization, traffic routing, and social network analysis. Google’s PageRank, Facebook’s Graph Search, and Amazon’s and NetFlix’s recommendations are some examples of graph-driven applications. In this article I’ll explore two common problems in which graphs are used – the Least Number of Hops and Shortest-Path problems. A graph is a mathematical construct used to model the relationships between key/value pairs. A graph comprises a set of vertices (nodes) and an arbitrary number of edges (lines) which connect them. These edges can be directed or undirected. A directed edge is simply an edge between two vertices, and edge A→B is not considered the same as B→A. An undirected edge has no orientation or direction; edge A-B is equivalent to B-A. A tree structure which we learned about last time can be considered a type of undirected graph, where each vertex is connected to at least one other vertex by a simple path. Graphs can also be weighted or unweighted. 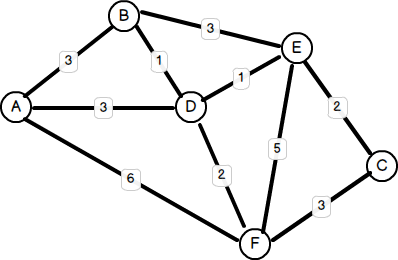 A weighted graph, or a network, is one in which a weight or cost value is assigned to each of its edges. Weighted graphs are commonly used in determining the most optimal path, most expedient, or the lowest “cost” path between two points. GoogleMap’s driving directions is an example that uses weighted graphs. A common application of graph theory is finding the least number of hops between any two nodes. As with trees, graphs can be traversed in one of two ways: depth-first or breadth-first. 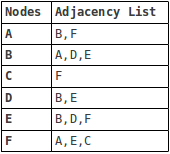 We covered depth-first search in the previous article, so let’s take a look at breadth-first search. For the sake of simplicity, let’s assume that the graph is undirected – that is, the edges in any direction are identical. Our task is to find the least number of hops between any two nodes. In a breadth-first search, we start at the root node (or any node designated as the root), and work our way down the tree level by level. In order to do that, we need a queue to maintain a list of unvisited nodes so that we can backtrack and process them after each level. But how do we know which nodes are adjacent, let alone unvisited, without traversing the graph first? This brings us to the problem of how a graph data structure can be modelled. 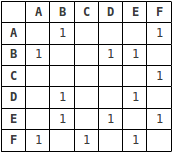 Adjacency lists are more space-efficient, particularly for sparse graphs in which most pairs of vertices are unconnected, while adjacency matrices facilitate quicker lookups. Ultimately, the choice of representation will depend on what type of graph operations are likely to be required. If we had used a stack instead of a queue, the traversal becomes a depth-first search. 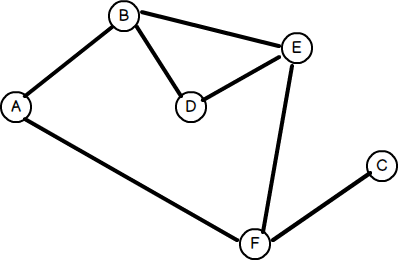 Another common problem is finding the most optimal path between any two nodes. Earlier I mentioned GoogleMap’s driving directions as an example of this. Other applications include planning travel itineraries, road traffic management, and train/bus scheduling. One of the most famous algorithms to address this problem was invented in 1959 by a 29 year-old computer scientist by the name of Edsger W. Dijkstra. In general terms, Dijkstra’s solution involves examining each edge between all possible pairs of vertices starting from the source node and maintaining an updated set of vertices with the shortest total distance until the target node is reached, or not reached, whichever the case may be. There are several ways to implement the solution, and indeed, over years following 1959 many enhancements – using MinHeaps, PriorityQueues, and Fibonacci Heaps – were made to Dijkstra’s original algorithm. Some improved performance, while others were designed to address shortcomings in Dijkstra’s solution since it only worked with positive weighted graphs (where the weights are positive values). $d[$v] = INF; // set initial distance to "infinity"
As you can see, Dijkstra’s solution is simply a variation of the breadth-first search! In this article I’ve introduced the basics of graph theory, two ways of representing graphs, and two fundamental problems in the application of graph theory. I’ve shown you how a breadth-first search is used to find the least number of hops between any two nodes, and how Dijkstra’s solution is used to find the shortest-path between any two nodes.